Few people would recognize Dayton, Ohio of 2008 as the industrial powerhouse it was less than one hundred years ago. Once a beacon of manufacturing success, Dayton claimed more patents per capita than any other U.S. city in 1900. Its entrepreneurial climate nurtured innovators such Charles Kettering, inventor of the automobile self-starter and air travel pioneers Wilbur and Orville Wright. As the U.S. economy took off after World War II, Dayton was home to the largest concentration of General Motors employees outside of Michigan. The city also nurtured companies that would became stalwarts on the Fortune 500, including National Cash Register (NCR), Mead Paper Company, business forms companies Standard Register and Reynolds and Reynolds, Dayco and Phillips Industries. To put this in context, just 14 U.S. cities could claim six or more Fortune 500 headquarters in 2007. Not a bad performance for an urban area that peaked as the 40th largest city in the U.S. in 1940. These early industrialists were more than just business men. They were also visionaries. The founder of NCR, John H. Patterson, is widely credited with laying the foundation for the first modern factory system, pioneering the basic principles that still drive much of modern advertising, and redefining the relationship between labor and management. NCR may also have been America’s first truly global business. “The cash register,” writes Patterson biographer Samuel Crowther, “is the first American machine which can claim that on it the sun has never set.” Even as Patterson was toiling away in a little shop in Dayton, cash “registers were being sold in England and Australia.” The company’s first non-US sales office was established in England in 1885 and its first European factory was established in Germany in 1903. It’s difficult to underestimate Patterson’s influence on American industry. By 1930, an estimated one-sixth of all U.S. corporate executives had either been an executive at NCR or been part of Patterson’s management training programs. Among NCR’s alumni were IBM’s visionary CEO Thomas Watson as well as the presidents of Packard Motor Car Company, Toledo Scale, Delco (now Delphi) and dozens of others. What may separate men like Patterson to their equivalents today in places like Silicon Valley was their intense civic involvement. Patterson was one of the first business leaders to try to apply scientific management to local government, testing out his ideas in rebuilding the city after a disastrous flood ruined downtown Dayton in 1913. He also helped create the Miami Conservancy District, one of the nation’s first flood control districts that still manages a system of low-level dams and levies that keep downtown flood-free to this day. Perhaps one of Patterson’s most prescient civic innovations was bringing the city manager form of local government to the first large city in the U.S.
As significant as Patterson was as an individual, he was not alone. The Dayton area benefited from the entrepreneurial drive and civic commitment of hundreds of businessmen that built large companies, many publicly traded. Patterson was the most iconic of the icons. 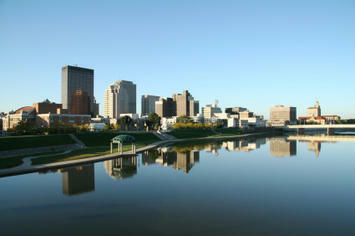 Today one would not expect such vision in Dayton, and you would be unlikely to find it. Since the early 1970s, nearly 15,000 manufacturing jobs disappeared at NCR. Automobile plants cut payrolls as the economy restructured toward services, and foreign competition outsold domestic manufacturers. As late as 1990, five General Motors plants employed more than 20,000 people regionally. Now, fewer than 12,000 work in these factories and Delphi is on the cusp of closing two more plants. NCR’s world headquarters employs fewer than 3,000 people. Mead Paper Company has merged with a competitor, becoming MeadWestvaco and its corporate headquarters has moved to Richmond, Virginia. As the economy has tanked, the city has shrunk. After peaking at more than 260,000 people in 1960, the city is barely clinging to a core city population of less than 160,000. In the 2000 census, Dayton ranked 147th in size nationwide. Its metropolitan area is now ranked 59th. Meanwhile, the suburbs have grown. Nearly 74 percent of Montgomery County’s population lived in Dayton in 1930. The growth of suburban cities shrunk that proportion to less than a third by the mid 1980s. Now, less than 20 percent of the metropolitan area’s population lives in the city of Dayton. Dayton’s early dependence on traditional manufacturing, with a particular emphasis on assembly line work, put the region at a competitive disadvantage as growing international trade and dramatically reduced transportation costs allowed for the global dispersion of factory work. Yet perhaps most remarkable is not the region’s decline, but its resilience. Despite the ongoing decline of manufacturing sector, the metropolitan area still knits together a population of over one million people. What accounts for this? First, the regional economy has diversified. Now, as in other metropolitan areas, the growth in employment is in services. Two local major health care networks – Premier Health Partners and Kettering Medical Network – employ 15,300 in facilities that are nationally recognized for their quality of care. Wright Patterson Air Force Base is a center for scientific research and development and employs another largely civilian workforce of 21,000. Second, some of the large industrial companies of the past have evolved to meet the needs of an information economy. NCR, while its presence has diminished, is now a high tech company. Reynolds & Reynolds, a former business forms manufacturer, now provides software in niche markets such as auto sales. The region is also home to the legal information services provider Lexus/Nexus, now a division of Reed Elsevier but originally a division of the Mead Paper Company’s investment in data management services. Third, core parts of the traditional manufacturing base literally retooled to become globally competitive. In the early 1980s, more than 600 machine shops employed nearly 20,000 people. As the 1990s unfolded, this number had fallen by half. As the 21st century got its start, the number of tool and die shops had revived and employment was rebounding close to 15,000. The shops remain small, but they are deeply invested in global trade. Productivity is up along with incomes. Fourth, the region remains at a strategic logistical and demographic location in the Midwest. The city of Dayton is at the cross roads of two major interstate highways – the major east-west link I-70 and the north-south connector of I-75. Combined with access to three major airports, the Dayton region can easily benefit from and tap into economic growth in nearby metropolitan areas such as Columbus, Cincinnati, and Indianapolis. Ironically, many of the highway improvements some believed would “empty” the downtown – the interstates plus a partial beltway, I-675 – ended up tying the city and suburbs to other larger urban areas and enhanced the region’s geographic importance. Dayton’s economy may no longer provide the flash and glitter of 20th century economic leadership, but the region has demonstrated a remarkable robustness that holds lessons for other cities striving to remain competitive in a global economy. All cities or economic regions pass through periods of growth and decline. The real question is whether they can adapt to changing economic circumstances. Dayton survived by building on the secrets of its past success. Its innovative manufacturing base has become more tech-centric and service-oriented. New areas of vitality such as health services have been enhanced. The city may no longer be what it was at its peak a century ago, but its future is far from grim. Sam Staley, Ph.d., is director of urban and land use policy at the Reason Foundation and teaches urban economics at the University of Dayton. He is a fourth generation native and current resident of the Dayton area. Submitted by zion1122 on Wed, 08/21/2013 - 05:53. Submitted by zion1122 on Thu, 08/01/2013 - 05:13. Submitted by robert1122 on Mon, 07/29/2013 - 06:44. Nice to be visiting your blog once more, it continues to be months for me. Nicely this post that i’ve been waited for so lengthy.